We hope that your wedding planning is going smoothly, here is this week's Sweet Treats to make fill you with inspirational ideas. 1. The utterly enchanting blue dress that Zooey Deschanel wore in 500 Days of Summer can be yours. Perfect for a rehearsal dinner or courthouse wedding. Swing on over to Shaunas World and she can recreate the dress just for you. 2. Joy Ever After makes the perfect wedding gift for the couple who wants an elegant reminder of their special day. 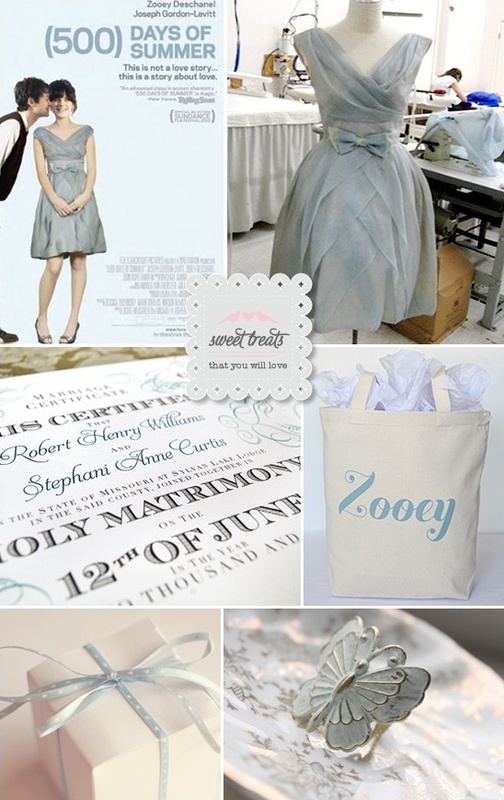 We love this personalized stylish wedding certificate. 3. Have you seen our new Simple Tote? It is simply delicious. For $26 you can customize the name and color of your besties. We also have Bride, Bridesmaids and Maid/Mator Of Honor totes in our new Simple Collection. Have a look and if you like what you see, use our promo code 'weloveyou' off 30% off of your order. 4. This is actually a print you can buy over at A Life Through The Lens. Besides be beautiful it also makes a great example of a simple guest box that you can fill with goodies for your guests. 5. The Ardent Sparrow has some truly stunning jewelry that you will love. Be sure to check out these vintage inspired pieces.